Even as the fullness of the Sun hung heavy in the summer sky, our ancestors noticed that each succeeding day saw the Sun rising later and setting earlier. As an assurance that the Sun would retain its power until the harvest was complete, the Celts celebrated a ritual marriage on this day between Lugh, the Sun, and Eire, the Earth. This cosmic mating of the male and female energies was vital to the maintenance of harmony and abundance. We have seen in our time the effects of imbalance of yin and yang. The restoration of this harmony and abundance in our lives and on our planet is a sacred task that each of us must shoulder. The male and female in each of us must learn to love itself, and, from that, to love the other. On Teltane, or Lammas, or Lughnassad, Lugh, the Celtic god of Light buried his foster mother Tailltiu beneath a great mound in Ireland. This signifies the withdrawal of the Mother Goddess into the earth in preparation for the falling seeds that will need her care if they are to germinate in winter. midway between the Summer Solstice and the Autumn Equinox. This festival is astrologically determined by the Sun's approaching 15 degrees of Leo. a fascinating site that takes you into the realm of our Earth's planetary rhythms. Enjoy! even recipes for this Celtic celebration, click here. For worldwide annotated and illustrated Lammas links, click here. 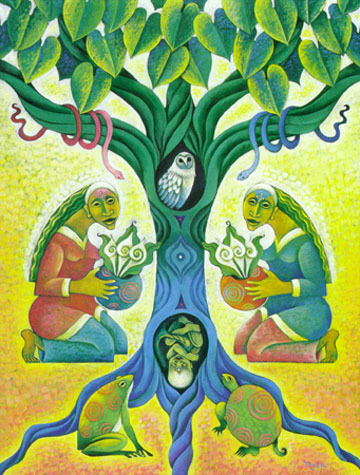 "Blessings Round the Tree of Life"